When our company made the decision to build our own building, we committed ourselves to making it a model for sustainable, environmental development. 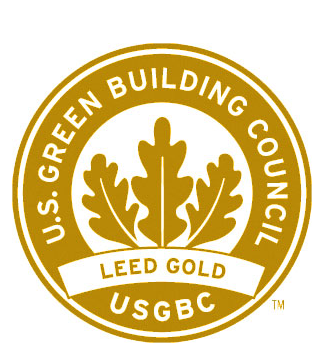 Our building is the greenest building in Palo Alto and the first commercial project in the city to receive LEED gold designation from the U.S. Green Building Council. We are hopeful that our success will inspire future developers to meet or exceed what we have achieved. We not only wanted to be a leader in using traditional green strategies such as reducing energy use, but also in creating a healthy and attractive work environment for our employees. At the top of our list was maximizing natural light. The existence of a shared driveway easement with our next door neighbor and a residential condominium development behind us meant we had permanently protected southern, western and northern exposures and an opportunity to have windows on three sides of the building. The southern and western-facing windows are perfect to take advantage of the sun's lower arc during the winter, providing passive heating through the windows and reducing our heating requirements. In the summer, with the sun higher in the sky, the windows do not experience as much direct sun and are protected by shade features such as the third floor overhanging the second floor on the west side, interior shades that reflect light and heat and, where possible, windows that open for natural ventilation. Many other features of the building help us to keep energy use down. The entire east wall of the building is concrete, a natural coolant during warm months. The roof utilizes a highly reflective white surface to prevent heat build up. This type of roof will become the standard for commercial buildings. Heating and air conditioning is provided by the newest and most energy efficient systems on the market. The building uses only electricity. We don't even have a natural gas line to the building. The building has eight separate climate zones, each controlled by high-tech electronic thermostats. Comfortable temperatures can be maintained in the various micro-climates throughout the building and adjusted to the work schedules of each department. That way we never heat or cool an area of the building that isn't occupied. One of the most innovative features is the integration of interior air quality controls. Carbon dioxide sensors throughout the building constantly measure the quality of the air and when the air is stale will automatically signal the heating and air conditioning system to bring in and circulate fresh air from the outside. Special filters prevent dust and other contaminates typically found in most offices from circulating. Lighting design was also a major focus of our planning and a key factor in reducing our energy use. throughout the building automatically turn off lights when an area is vacant, making it impossible for lights to be left on accidentally or unnecessarily. All basic room lighting uses low-wattage compact florescent lights, while task lighting is provided only by highly efficient LED lights that use only 9 watts of power. Water conservation was another important goal of our design. All fixtures are low-flow and have reduced our monthly water consumption to only five cubic feet at a total cost of under $30. While the greatest environmental benefits come from energy conservation, green building principals extend to all aspects of design and construction. For example, all wood utilized in the building — primarily for doors and stair hand-rails — are certified as having been made in compliance with national forest sustainability practices. To minimize the environmental impacts from unnecessary transportation, building materials were obtained locally whenever possible. Another important green feature of the building is an underground Roman drain that helps to divert all surface and roof rain water away from the city's storm drain system. All rain water from the roof and hard surfaces drains to our driveway made of permeable pavers, and then is collected in an underground gravel-filled reservoir and is absorbed into the aquifer. Only in the heaviest of storms does water overflow to the street and the storm drain system. In designing the interior space of the building, our goal was to use an open floor plan that provides future flexibility, a collaborative work environment and would allow natural light to reach virtually every employee. To encourage use of stairs instead of the elevator, we designed a welcoming front stairwell that is integrated into the lobby and includes oversized doorway openings at each floor. On the third floor, a protected deck provides umbrella tables for lunch or outdoor meetings, all with a beautiful view of the nearby foothills. We partnered in this effort with many local professionals — architects, designers, consultants, subcontractors and vendors. 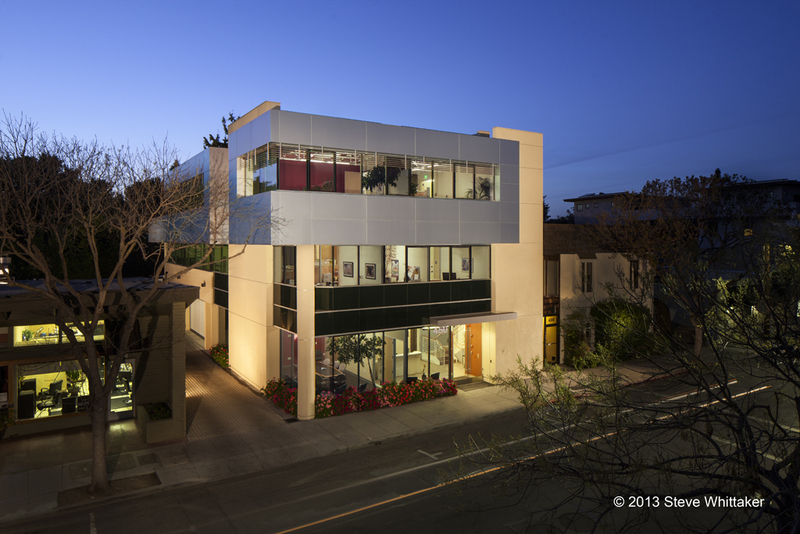 But our most crucial partners, without whom we could not have succeeded, were Jim Baer, a long-time Palo Alto developer, property manager and environmental advocate, and Charlie Brock of Cody-Brock, our San Carlos-based general contractor. Both invested much of their own time and energy to learn with us about green building design and construction and carefully ensure that the work of our subcontractors resulted in our meeting the goal of becoming Palo Alto's first newly constructed LEED gold commercial building.